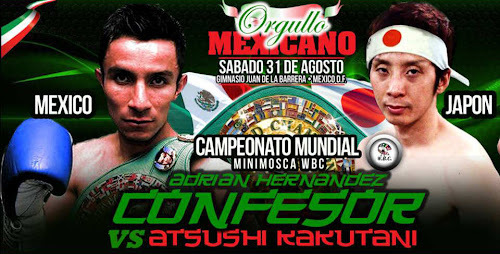 The fight between Adrian Hernandez vs Atsushi Kakutani is for the WBC light flyweight title championship. If you could see the actual fight or the video replay highlights of Hernandez vs Kakutani, it was a great fight where the two pugilist don't want to give in and never gave until who will finally win the WBC light flyweight battle. Mexican Adrian Hernandez 27 wins and two losses coming into the fight while the Japanese rising star has a professional record of 13 wins and 3 losses coming into this fight. The fight was held on August 31, 2013 at Gimnasio San Juan de la Barrera, Mexico City, Distrito Federal, Mexico. It was the 3rd title defense for Adrian Hernandez all in his hometown. Hernandez defeated the Japanese Atsushi Kakutani en route to round 4 TKO victory and improved his record to 28 wins while Kakutani remain at 13 wins with 4 losses including this recent fight. I hope you are entertained upon watching the Hernandez vs Kakutani Fight. What can you rate about this fight?